This week GM is dusting off the Georgetown Time Machine to bring you to the corner of M and 34th. The year is likely in or near 1964. The Buick Invicta at the bottom right has a 1964 Virginia license plate. That would be consistent with the other cars on the road. As for the road itself, it was still unpaved at this point. The streetcars had only stopped running a couple years earlier. What surprises GM somewhat is that it appears that there are four lanes heading west and only one going west. 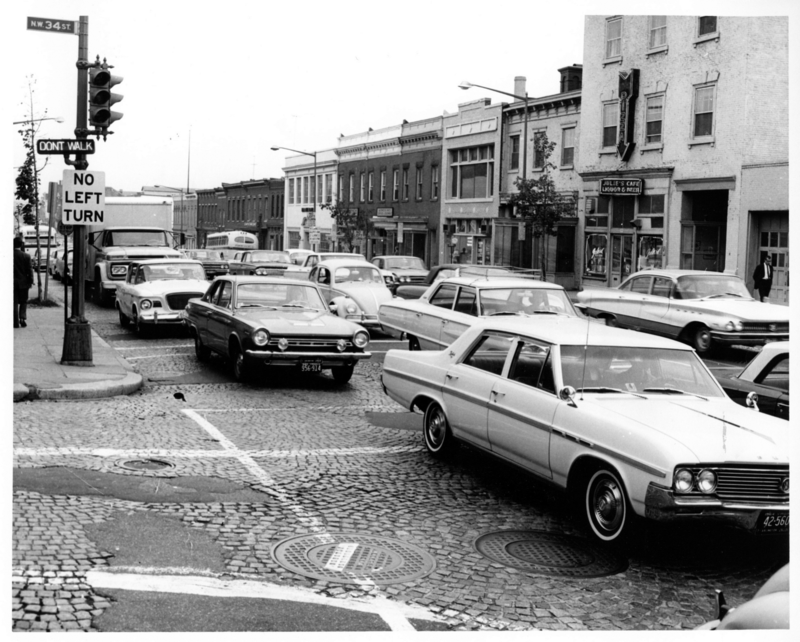 Did M St. once have reversible lanes? (If so, obviously they didn’t really work any better than our current arrangement; thus demonstrating once again that find room for more cars will only lead to more cars). As for businesses, the only one GM can make out is Julie’s, which apparently sold liquor, beer and pizza. Julie sounds like a good person to know.